This picture was technically taken yesterday, but it was after school, so I'm counting it, and because today was a full day of mandatory HR training and the only picture I could have taken would have been of the back of 20 human heads half asleep. 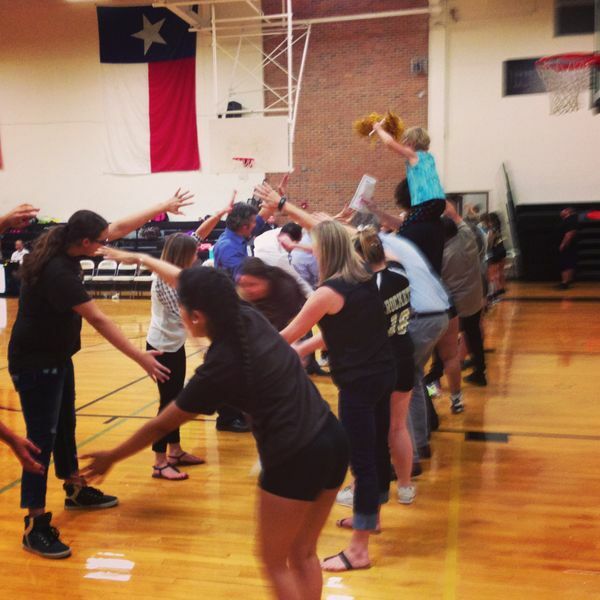 So here's to our Teacher Appreciation volleyball game! Teachers (selected by players) were given little gifts (one math teacher got the whiteboard markers he's been wanting) and cookies before the varsity game. I thought it was really great that they were invited down to the court to participate in the run through as well. I do apologize to all the science teachers for eating their cookies while on the court. Your fault for leaving them with me though.